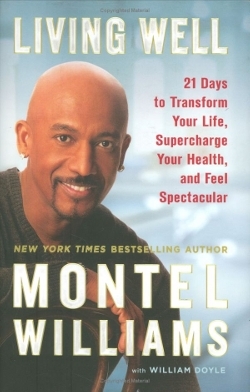 Want to know the secret to Montel Williams' powers? I'll give you a hint. It's green and it tastes great! It's a Green Smoothie! Well it's not actually the secret to his powers. And it's not the only thing that Montel does to stay healthy. But it's a very important part. (If you reached this page first and want to read about Montel, click here. Cir and I just purchased a Vita-Mix machine. What's a Vita-Mix you ask? It's the single best item we have ever purchased as far as our health is concerned. With it we can make whole food juices, smoothies, soups and even ice creams. Cir first heard about the Vita-Mix when he was 15 years old. He saw an ad in a magazine and was sure that it would be a good purchase. He was health conscious even at that young age. Well 35 years later, we finally have our machine. And we are so impressed. It does everything we thought it would do and more. From the very first day when we pulled it out of the box, put in our fresh fruits and vegetables and turned it on, we've loved it. The first juice was, well......, very thick. It didn't taste all that great, but we had made. We had made our own juice! From fresh fruits and vegetables! Go figure! Since then we've actually read the directions and everything we've made has tasted delicious. Well, mostly everything. (Our potato soup tasted a little raw, because we forgot to cook the potatoes first, lol). But, believe me, we enjoy experimenting and coming up with our own recipes. Our granddaughter loves whole food juices. She sips it from her little sippy cup and says, "Ummm, that's good!" She's loved every one of our mixtures, and always comes back for more. She has named anything that comes out of the Vita-Mix - "Flower Seeds", so we now have "Flower Seeds" every morning. She's so sweet! In his book, Montel Williams recommends green smoothies as the "blast of nutrition and energy that helps power me through the day". 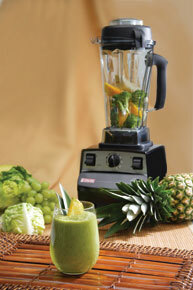 He uses his Vita-Mix machine to make a delicious, low fat, heart healthy, raw, smoothie. I even have the recipe. If you have a juicer other than the Vita-Mix, go by the instructions that go along with your machine. Place all ingredients in Vita-Mix container in order listed. Secure 2-part lid. Select VARIABLE, speed #1. Turn on machine and quickly increase speed to #10; then to HIGH. Run for 1 minute or until smooth. Montel Williams attributes this smoothie to giving him the "blast of nutrition and energy that helps power me through the day". He drinks it to help with his multiple sclerosis symptoms. We know what that feels like now. The energy you get from eating whole food is amazing. We get hungry less often. We are satisfied sooner, so we eat less. The nutrients are available immediately and go straight to the blood stream. We've both lost a little weight in the short time we've been using the Vita-Mix. For Mser's, weight management is so difficult. I have tried for years to cook healthy, low fat meals. And for the most part, we have been pretty successful at keeping our weight to a manageable level. More recently, though, it has become more and more difficult to keep from gaining weight. Even though we only gain a few pounds over the course of a year, that has added up. It is no longer acceptable for our health. For Cir, being less active has caused him to gain weight which in turn has caused back pain. For me, high blood pressure runs in my family. The more weight I gain, the more of a problem I have keeping it under control. The Vita-Mix was, for us, a good way to eat more healthy, save money, and lose weight. Montel Williams uses his Vita-Mix to take charge of his health. You can use it to do the same for your health. Montel has learned how to live well. He eats healthy whole food meals and exercises regularly. He likes the Vita-Mix so much that he features the machine on Day 3 of his Living Well Program. We plan to take full advantage of our new Vita-Mix the same way Montel Williams has. We'll let you know what happens!